A team of researchers at the U.S. Army Medical Research Institute of Infectious Diseases (USAMRIID), led by Dr. Arthur Friedlander, have demonstrated the first successful use of a non-toxin anthrax vaccine to protect monkeys from lethal infection. The study utilized the anthrax toxin capsule rather than anthrax protective antigen (PA) which is used in existing vaccines. Bacillus anthracis, the bacterium that causes anthrax, is recognized as one of the most serious bioterrorism threats. It produces three main components that allow it to do harm—lethal toxin, edema toxin, and the capsule. 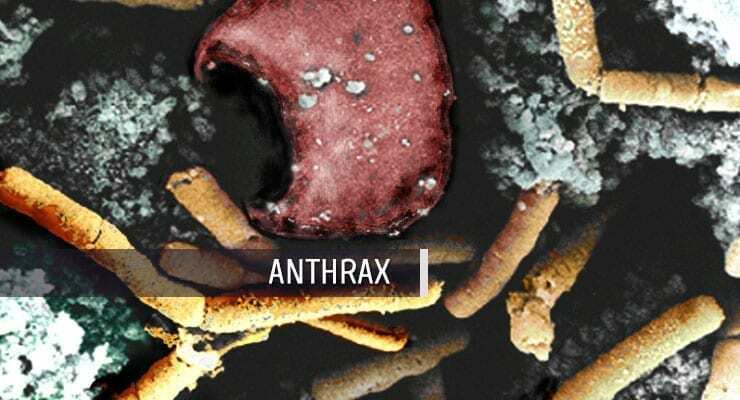 During anthrax infection, the bacterium invades and grows to high concentrations in the host. The capsule surrounds the bacterium and prevents it from being ingested and destroyed by the white blood cells, thus allowing anthrax infection to progress. The toxins are thought to act mainly by damaging the body’s natural defense mechanisms. Scientists at USAMRIID have extensively studied protective antigen, demonstrating that PA alone confers protection in animal challenge studies with both rabbits and monkeys. However, concerns about reliance on a single antigen—as well as the issue of protecting against anthrax strains that may be vaccine resistant—have prompted the search for additional vaccine components. Bacterial capsules are commonly used in licensed vaccines for other diseases, including certain types of pneumonia and meningitis.